Sustainable Town of the Future? Leonardo di Caprio is set to star in a new documentary called Greensburg, to be shown in the US by the Discovery channel. 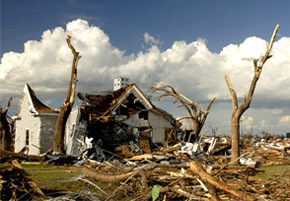 The show will track the rebuilding of a small town called Greensburg in Kansas which was devastated by a tornado last year in May. So far, the plans for the town include more than a dozen new buildings that meet the LEED standards from the US Green Building Council (USGBC). Across America only 63 buildings meet the stringent LEED, or Leadership in Energy and Environmental Design, Platinum guidelines at this point in time. In December, the town's city council passed a bill requiring that all major city buildings attain LEED Platinum status – the USGBC’s highest standards for efficiency and sustainability – making it the first city to do so. Filming is already well underway with the show being set for a May/June launch with the series being shown in 13 parts.